"Flat faced brachycephalic dog breeds such as bulldogs suffer from multiple medical problems due to preferences for dogs with a flatter face and pushed-in noses. One of the most prevalent problems are breathing issues referred to as brachycephalic airway syndrome. Brachycephalic airway syndrome (BAS) refers to several respiratory problems that affect the dog's mouth, throat and nose. One way to reduce or prevent breathing related problems is by keeping flat faced breeds at a healthy weight. This can ease breathing related difficulties and can help to avoid surgery in mild cases. Early diagnosis and treatment an result in a better outcome. Most dogs have multiple breathing problems that need to be corrected. If there is only one defect, such as a narrowing of the nostrils (called stenotic nares), the better the prognosis. The prognosis for dogs under 2 is higher than for older dogs. 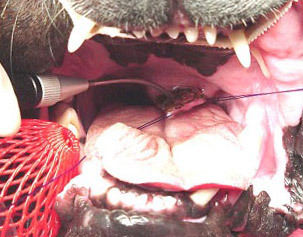 Surgical correction can result in a much better quality of life for the dog. Brachycephalic dogs can be prone to eye problems, dry eye, eye irritation and eyes that appear to pop out (proptosis). They are also prone to panting due to heat stress. Examples of Flat-faced Brachycephalic Breeds. The term brachycephalic is a Greek term for "shortened head." These breeds are known for their shortened facial bones that give the face a pushed-in appearance. The shorter bone structure results in proportionately excessive amount of soft tissue in and around their throats and noses, causing breathing problems such as heavy breathing or panting. Brachycephalic Syndromes can lead to sudden death due to acute airway collapse that results from airway obstruction due to many of the issues described below (see bottom of page for free brochures on the condition)." Everted laryngeal saccules: this is usually seen with other respiratory issues. Dogs with BAS and labored breathing can cause small pouches to form inside the larynx that are either sucked into the airway or turned outward. Hypoplastic trachea: This refers to a narrower-than-normal windpipe. This cannot be corrected surgically. Elongated soft palate: in this condition the soft part of the roof of the mouth is too long when compared to mouth length. At the back of the throat the extra soft palate tissue blocks the entrance to the windpipe (trachea). The elongated palate can be shortened to remove excess tissue in surgery. Stenotic nares: This refers to narrow nostrils that restrict air that can enter into the nose. Air flow can be improved by using surgery to remove tissue from the nostrils. Diagnosis of Brachycephalic Airway Syndromes is based on the dog's facial shape, physical examination, breed, and clinical symptoms. Abnormalities are diagnosed by sedation or by putting the dog under anesthesia. Note that in some cases sedation or anesthesia could be dangerous given breathing abnormalities. Tests used are a tracheoscopy or a laryngoscopy, where a fiber optic scope is inserted through the mouth into the trachea and larynx. The condition can be diagnosed as young as age 1, and usually some time between age 1 year and 4 years. Additional tests such as blood work and X-Rays can be used to determine the health of the patient prior to initiating treatment. The veterinarian will also want to rule other other causes of breathing difficulties such as an upper respiratory infection or allergy that can cause a dog's airways to swell. Keeping a bulldog at normal weight can reduce any breathing discomfort and relieve symptoms such as snoring and labored breathing. If your dog is breathing heavy, or the breathing seems labored, be sure to visit your veterinarian for a checkup. Dogs with BAS tend to have more than one breathing problem that needs to be corrected. Slimming down a bulldog or other flat-faced breed will help to reduce BAS symptoms such as snoring and labored breathing. Also consider getting a harness that does not tug at the dog's neck. Breathing problems often accompany issues such as gastric reflux, which pushes gastric fluids into the esophagus, causing additional problems. Owners should also avoid situations that cause labored heavy dog breathing such as excessive physical exercise and stress, particularly on hot days. Oxygen therapy and anti-inflammatory medications are often used to bring relief to dogs. Relief is short-term with surgery being the best option for long-term relief. For most dogs with BAS surgery is the recommended treatment in order to correct any structural abnormalities in the throat or face. Many bulldogs require respiratory surgery where the elongated soft palate at the back of the throat is shortened, allowing the dog to breath easily. New surgical techniques such as the use of lasers can reduce recovery times and result in lower levels of bleeding and swelling. Post surgery brachycephalic dog breeds will need to be monitored closely since the surgery can cause airway swelling, resulting in an even narrower air passage until the swelling subsides. In some patients it may be necessary for a veterinarian to use a nasotracheal catheter where a tube is passed into the trachea via the nasal passage. In chronic cases, a dog will require a tracheotomy, which is a procedure where an incision is made in the dog's wind pipe. Post surgery medications can help to reduce any pain and antibiotics are administered if there is a risk of infection. Dogs will need to return to the veterinarian for two weeks after surgery and exercise might be restricted over this time. The cost of surgery for brachycephalic dog breeds runs between $500 and $3,000 (U.S. dollars) depending on the extend and number of breathing problems that need to be corrected. Brachycephalic dog breeds that undergo surgery and that are under age 2 have the best prognosis. Having fewer defects that need to be corrected also results in a better prognosis (e.g;; 1 defect has a better prognosis than 2). Many dogs can experience a significantly better quality of life after surgery. Have A Question about Dog Breathing Problems for Our Vet? Do you have a question or comment on a dog breathing problem such as Brachycephalic Airway Syndrome (BAS) or heavy breathing and panting? Share it!